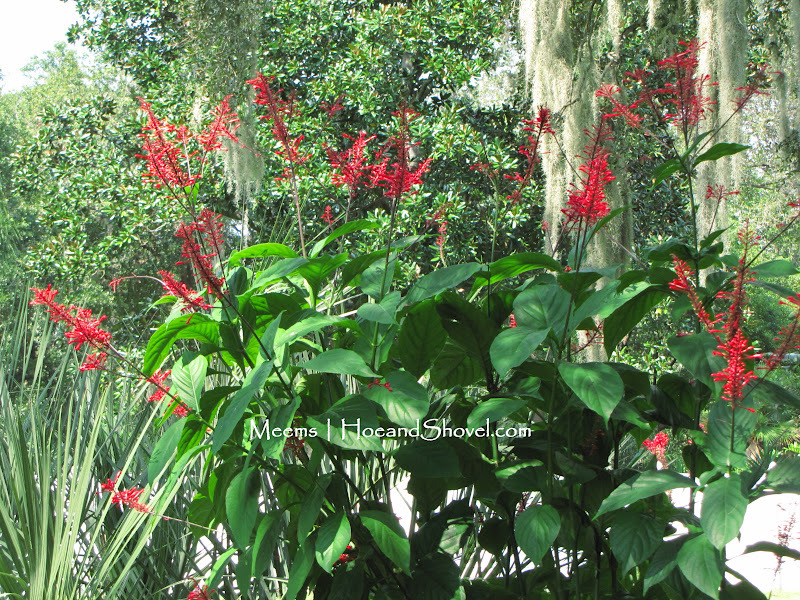 It's always nice to discover one more easy-care plant with outstanding attributes to grace our Florida garden. 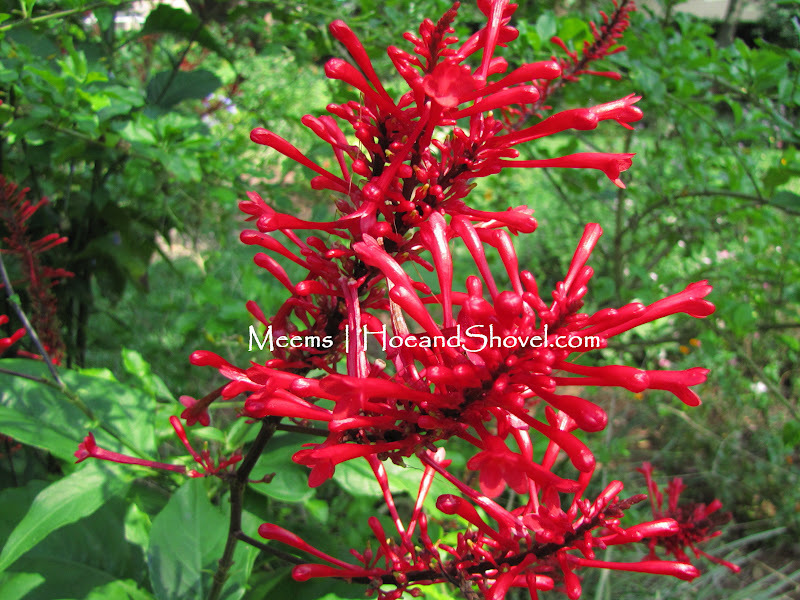 Brilliant, fiery red blooms would be plenty to convince me I needed firespike (Odontonema strictum) in my naturalistic garden beds. Red is red. Who doesn't love red! It attracts me AND the hummingbirds and butterflies! What a treat is has been to watch the Ruby-throated hummingbirds nectaring from the tubular blooms all summer long. The red blooms begin in summer and will continue through fall. It is said firespike does well in full sun or partial shade in zones 8-11. In my garden it does best with partial shade. I've noticed them planted in full sun elsewhere and the leaves appear a bit bleached out, but still blooming. Here it is combined with native plants such as coontie, oakleaf hydrangea, spiderwort, blue-eyed grass, and saw palmettos. Other Florida-Friendly plants in this bed include Giant Liriope, variegated aztec grass, Caladium 'Red Flash' and 'Freida Hemple', African Iris, and red pentas further down just to name a few. My first 2 plants were started and passed along to me by gardening friend, NanaK at My Garden Path . Since then, I've made several more plants from cuttings to spread them around the garden. Too easy. More food for more hummingbirds. They will freeze back to the ground if we have a tough winter but also return quickly from the roots in spring. You can probably tell mature firespike has stiff branching and they get fairly tall to about 10' in these conditions. Have you discovered this plant for your garden? Which plants are you growing to attract hummingbirds to your fall garden? Can Naturalistic and Tidy Meet in the Middle? Thanks for showing this plant - one for my wish list I think, esp since it grows in sun and part shade. 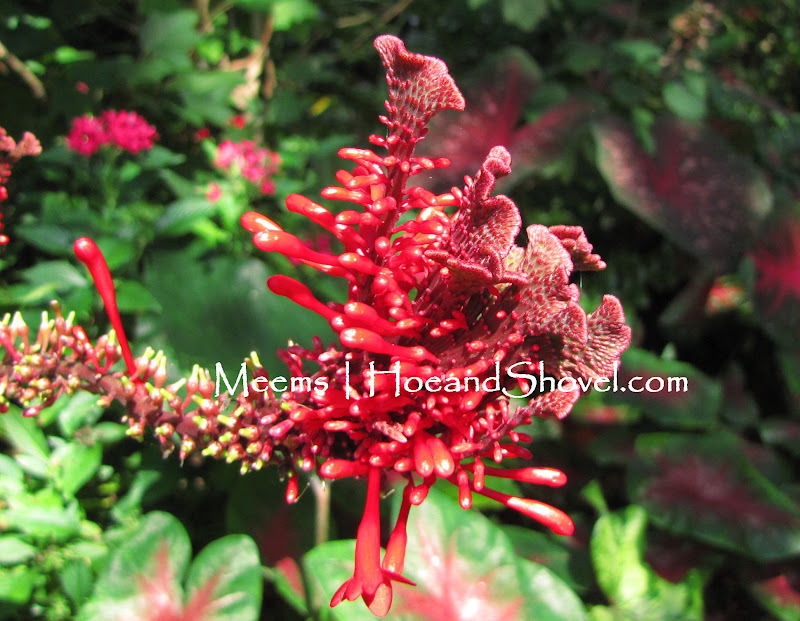 The Red Firespike remind me of Canna Plants. They look great! Thanks the links on the bottom, as a fellow FL gardener it is much appreciated! I like the combination of coontie and firespike--very pretty! 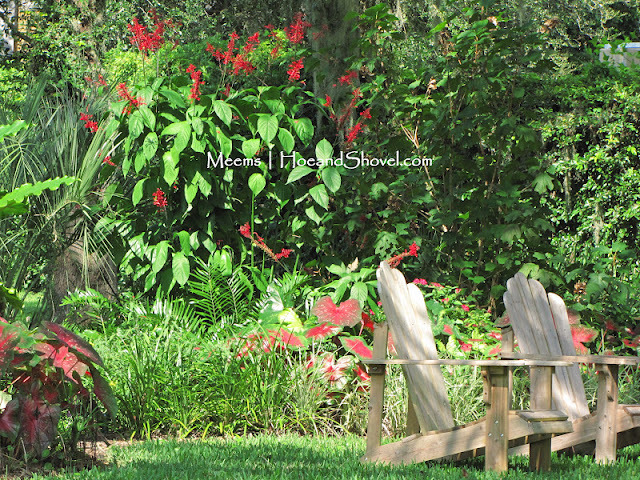 The red blooms also contrast really nicely with the Spanish moss in your second picture. I also have that but the butterflies don't go there much because they prefer the others. We don't have hummingbirds and i don't see the sunbirds go there too. It is our nearest to hummingbirds. I can see why hummingbirds would love this... it's gorgeous! Duncheon's Garden Center in Land O'Lakes sells it and it's blooming, too. I just saw some there yesterday. Ahh! So this is firespike. It's pretty. I'll plant one in my garden. But I am still contemplating where I'll put it. Nice garden you have there. I haven't yet ventured into hummingbird attraction in the garden. This plant beats having a feeder though! So much easier! Being an apartment-dwelling armchair gardener, I depend on blogs like yours to teach me about all the different plants...the firespike is stunning and a new one to me. Thanks for sharing it. I have 2 large firespikes and the hummingbirds love them - and so do I!